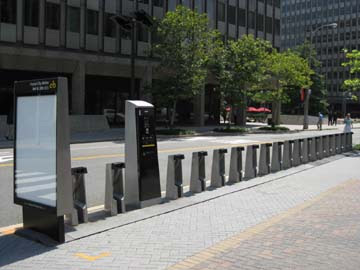 The first two Capital Bikeshare stations were installed today in the Crystal City neighborhood of Arlington, Virginia. 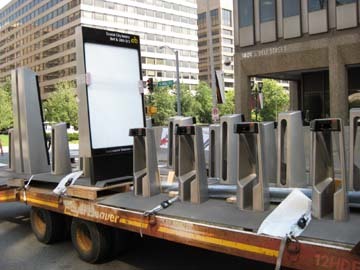 The remainder of Arlington's 14 stations will be installed over the next three weeks, along with DC's 100 stations. 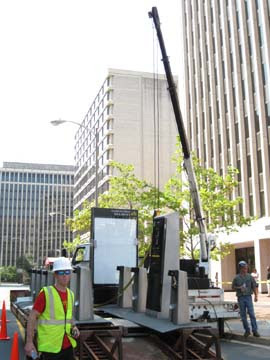 The installation was seamless with a boom truck arriving to unload the 19-dock station across the street from the Crystal City Metrorail station. Each modular unit was unloaded by the boom operator, while staff shuffled the units into place on the sidewalk. The units were then pushed together and wiring was finished, along with placing the solar panel on top. Lots of passersby stopped to ask what was going on. Is it a big bike rack? Where are the bikes? How do I join? Staff in neighboring buildings, people on their way to lunch, and students on their way to class stopped by. 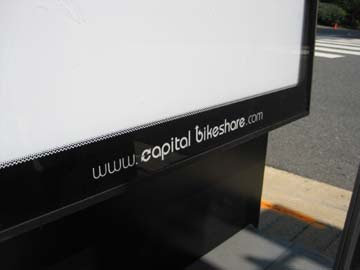 Many shared their love of cycling and look forward to using Capital Bikeshare once it's running in late September. All in all, it was a good day, but hot. It was a Code Red day due to the poor air quality. It's ironic because bike-sharing is one of the tools in the toolbox that will combat climate change in the D.C. region and improve air quality. This past Friday, the Metropolitan Washington Council of Governments (MWCOG) submitted a request for $12M USD to the U.S. Department of Transportation's TIGER II discretionary grant program for an expansion of the upcoming Capital Bikeshare service. If won, the funding would provide an 80%/20% (Federal/local) match for an expansion of the service within Arlington and D.C., as well as bringing in four adjacent jurisdictions and a large state university into the program. 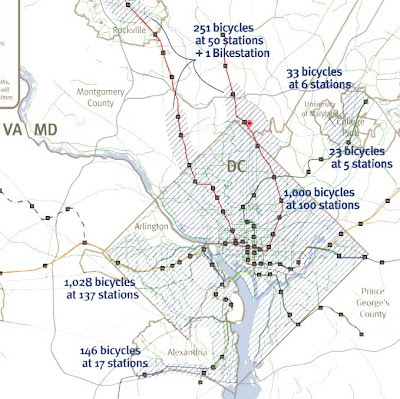 Capital Bikeshare will launch in September with 1,110 bikes at 114 stations. With TIGER II funding, the service would quickly expand to 3,578 bikes at 431 stations -- a substantial increase -- as early as next spring, making it nearly as large as Montreal's Bixi. MWCOG's application and cost-benefit analysis can be found online for other regions to benefit from. While MWCOG was putting together this grant application with the assistance of the jurisdictions, it was great to see the region coming together over bike-sharing and bicycling. With many other transport needs, the region chose this project as being our collective future. Now that's exciting. The TIGER II grant application is a follow-up to the region's TIGER I grant application last year which was unsuccessful at securing funding due to the high demand of projects for the amount of available funding. Hopefully, this time the application will meet with better luck. 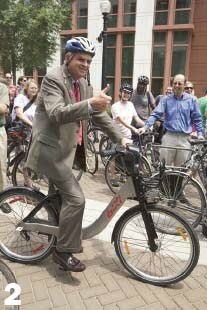 It does help to include in your grant application a photo of the U.S. Secretary of Transportation, Ray LaHood, giving a thumbs up on one of your demo bikes, like the photo above. 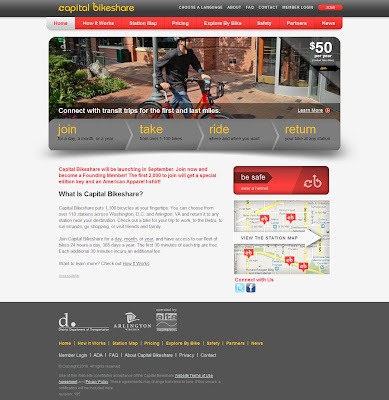 Capital Bikeshare -- Arlington, VA and Washington, DC's upcoming bike-sharing service -- launched its website on August 11 at CapitalBikeshare.com. Memberships are going like hot cakes with over 600 memberships being sold within the first five days of availability. Membership registration is now available with the first 2,000 month or annual members getting a Founder's Key and Capital Bikeshare t-shirt. Annual membership costs $75 -- with a discounted price of $50 for the time being -- month membership is $25, and day membership for $5, tax included. With the launch date likely in late September, activity is fast and furious to get everything ready in time. The equipment is arriving at the contractor's warehouse, barriers are being constructed at on-street locations, information panels are being finalized and printed, a demo station and bikes are being showcased at various events around town, and installation in Arlington is to begin next week! I'll be there to record and share here. It's time to remember what Arlington and D.C. are like now because when CaBi arrives, the urban core of this region will be changed. A new momentum will be in place.